Not every link posted on Facebook catches my attention, but this one did and I clicked the link. Stop the Mommy Wars is a photo series that celebrates the choices that different families make in raising their children. 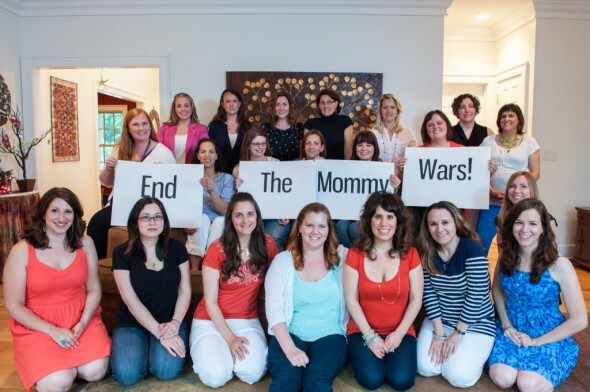 These moms in Connecticut put aside their personal viewpoints to appreciate what they did have in common – they were all moms who love their children. Each of the pictures shows two perspectives in parenting styles that have the potential to cause women to take sides, insisting their view is the “healthy” option. Accordingly, each of these women wanted to raise their children well. I have, sadly, seen many of these pictured battles played out in person. I have been the recipient of cutting remarks about my parenting choices over the years, and I’m betting you have too! The truth, for all women, is that most of the decisions we made BEFORE KIDS were altered AFTER KIDS and continually adjusted with each child we bore. I didn’t repeat the mistakes of my mother (one of my goals). Instead, I made a whole set of new ones–with each child. Nearly every mother I speak to wishes they could undo some of their mistakes or make different choices based on what we know now. Any review of parenting books and articles over the past few decades shows how fickle parenting experts are. When my first grandchild was due, I went to a grandparenting class. I flunked. I took the pretest and answered the questions based on how we were told by experts to treat babies – and how I treated mine. What was encouraged and accepted then (side sleeping–never allow baby to sleep on back, powdering babies, baby bed bumper pads, walkers with wheels, peanut butter, etc.) were all forbidden now. Today’s pendulum will surely swing again, and again, and again. And this applies to grandparents, too! My children have vastly different parenting techniques. I try hard to support them in their quest to raise their children, adjusting to their methods. Will they make mistakes? Definitely. So did I. But my grandchildren are loved, they know it, and my children are doing the best they can using the advice given them. They are parenting their children their way – which is the same thing I wanted to do. What I appreciated about these women in Connecticut was their willingness to encourage and not judge. What if more moms chose to encourage rather than point out flaws in each other? In these times, we could all use someone who does that – whether it is about our parenting or not. Sure, I can make quilts…and now I have rejoined society.